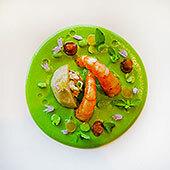 Under the guiding hand of General Manager Alexandre Durand-Viel, the cuisine of Château de la Messardière has been transformed in the last number of years. The gourmet restaurant "L'Acacia" has been remodeled inside and out and the chefs are providing marvelous cuisine on a high level of quality with respect for the regional tastes both in the luxury restaurant and for snacks and light meals at the pool side restaurant. Now to the food (to share our meal video click here >>). You need never leave the Château if you don't want to. 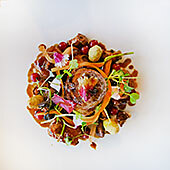 The Château's fine chefs have brought new live and energy to their gourmet restaurant "L'Acacia”. 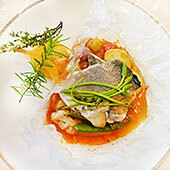 Both the main restaurant "L'Acacia” and the poolside restaurant "La Terrasse" has been remade and revamped. But it is "L'Acacia” that really caught our fancy. It was a little chilly when we were there so we had a table right by the wall of floor to ceiling seamless glass windows that are also fold away doors for indoor/outdoor dining. So our view out over the valley filled with the green of vineyards and spring growth was uninterrupted. Whether you eat outside or inside, the environment is delightful. The lighting comes on as the daylight recedes as one course follows another. The service is immaculate. The cuisine is replete with modern dishes that are at once a feast for the eye and for the palate with inventive modern renditions that yet stay true to the region. There is an emphasis on fish and seafood but meats and poultry are by no means neglected. The desserts are always a treat and we have found you can put yourselves in the hands of the sommelier with great confidence.